Elvia Foulke, retired as of May 1st 2012 as the Executive Vice President and Chief Operating Officer at Citrus Valley Health Partners. Elvia has been the executive vice president and chief operating officer of Citrus Valley Health Partners since 2001. Prior to that, she served as executive vice president of corporate development since 1994. From 1992 until the formation of Citrus Valley Health Partners she was senior vice president and chief financial officer at Queen of the Valley Hospital. 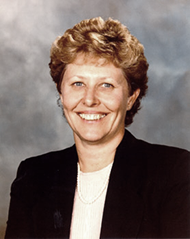 She previously worked as senior vice president and chief financial officer at Montgomery Ryland, Inc. (1988-1992); vice president, treasurer/chief financial officer at Centinela Hospital Medical Center (1984-1988); executive vice president, chief financial officer at Shearson/American Express Mortgage Corporation (1977-1984); and assistant controller at Sisters of Mercy in Burlingame, Calif. (1970-1977). Elvia received her Bachelor of Science degree in accounting and finance from the University of California at Berkeley. She was honored as a Woman of Achievement by the San Gabriel Valley YWCA in 2003.